What is a solar prominence? Prominences are high-density streams of solar gas projecting outward from the Sun’s surface (photosphere) into the inner part of the corona. They can be more than 100,000 miles long and can maintain their shapes for days, weeks, or even months before breaking down. 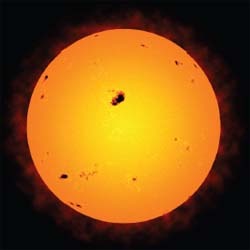 Sunspots are not actually dark; they just seem dark in comparison to the much hotter photospheric gas that surrounds them.